With three princesses in the castle, we have hundreds of bows. This fact did not stop Baby from announcing that she needed yet another bow. In fact, another pink bow. She did not want one of the many many pink bows that we already have, but a brand new one that is just hers. Sorry, hubby refuses to spend any more money on bows. BUT…. I can MAKE a bow. Out comes the pink yarn and the crochet hook. Chain 21. This will be how long your bow is, so you can make it bigger by adding another few chains or make it smaller but taking out a few chains. Totally up to you. Turn over and repeat step 2 a total of 5 times. 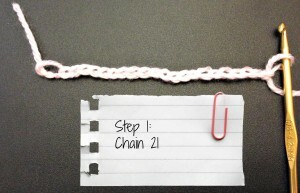 Tie off and sew ends into rectangle. At this point you should have a nice rectangle. 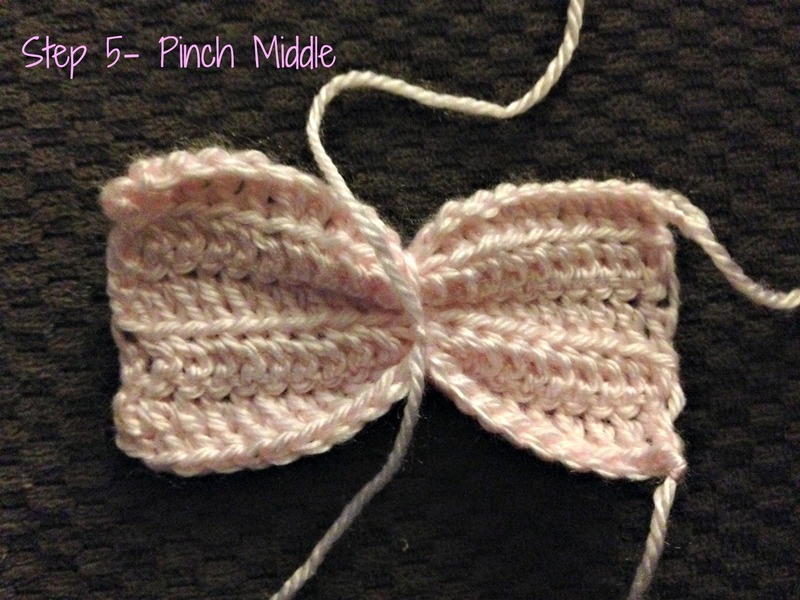 Cut off a long piece of yarn for the middle of the bow. 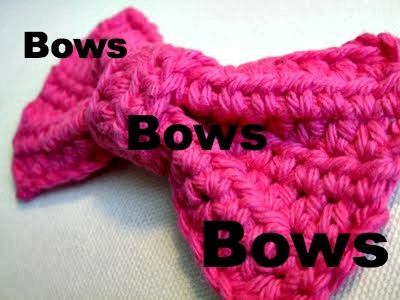 This can be the same color as the bow, or you can mix it up a bit and choose a different yarn. 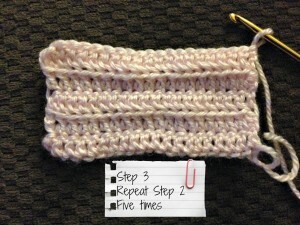 Pinch your rectangle in half and tie the yarn on the pinch. I put my pinched bow in the middle of my long piece of yarn. Tie off. 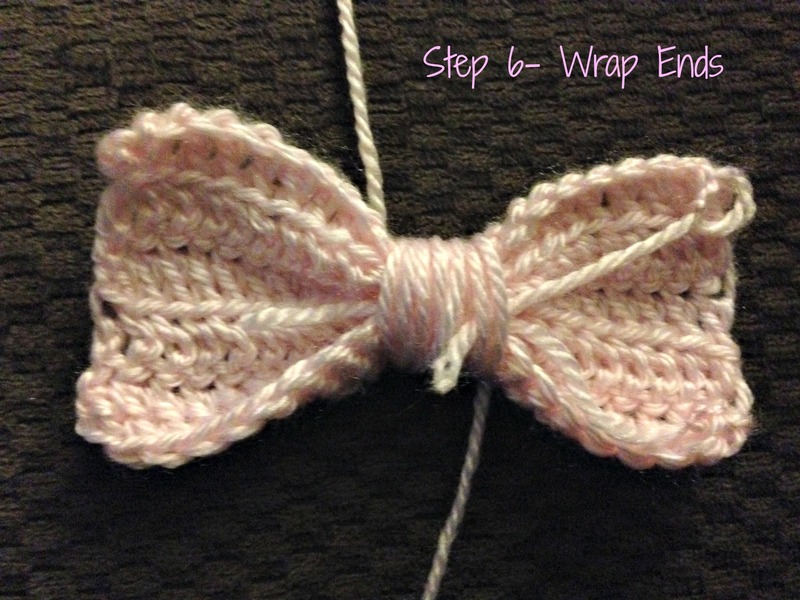 Wrap the long ends of the yarn around the middle of the bow. 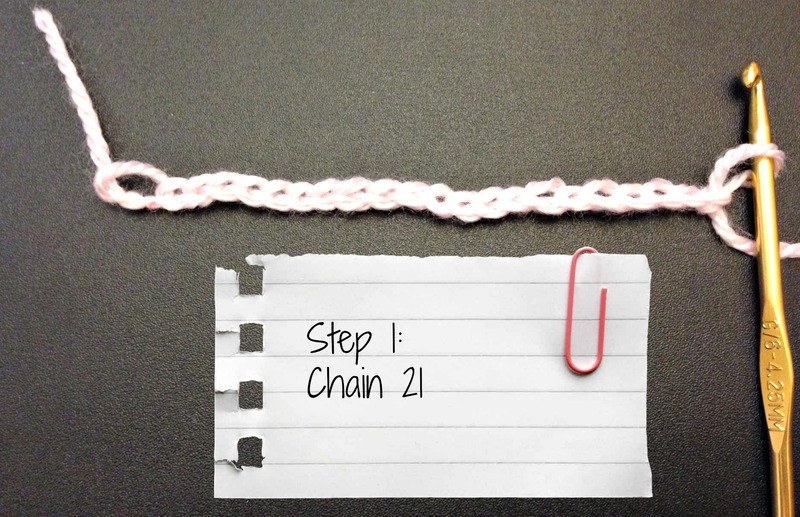 And tie when you reach the ends. 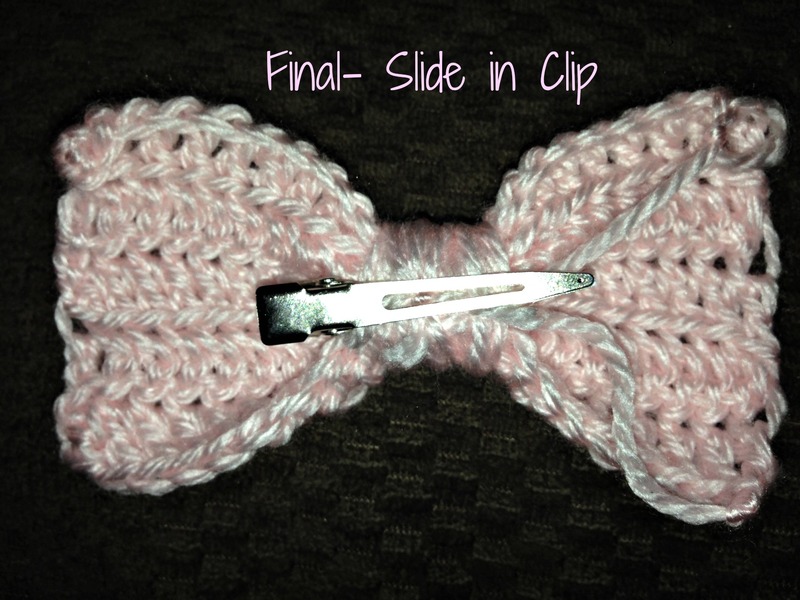 On the under side, slide your alligator clip into the “knot” of the bow. Fluff and perfect your bow. So easy!! I seriously made this sitting in front of the TV, during one show. Baby was so happy to get it the next morning. And both Tink and Belle needed some too, so we ended up making all the girls new bows. 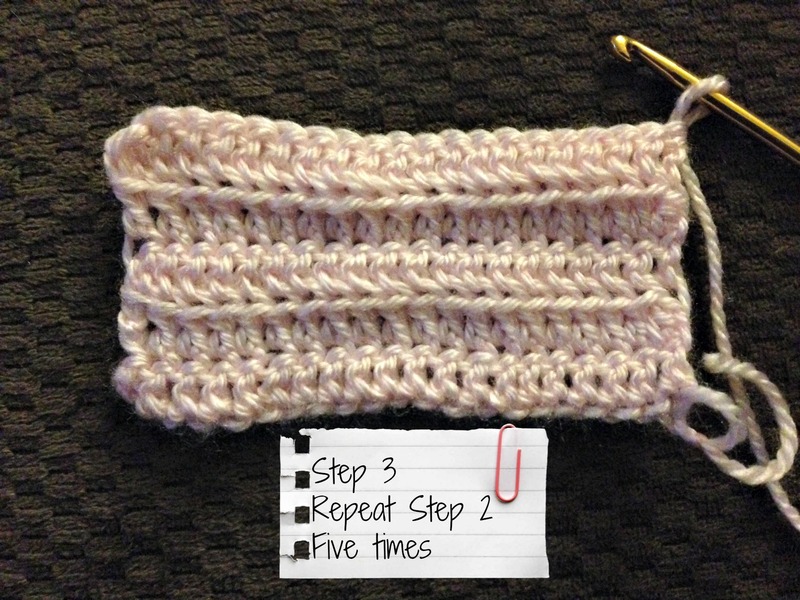 This was the first time that I put together a crochet tutorial. Was it easy to follow? How did your bows turn out? Very cute! I haven’t tried to make it yet, but I think your tutorial seems great. 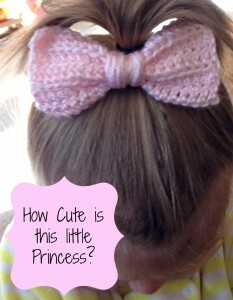 I love your creativity in getting around the no more buying bows edict! LOL!!! Oh we have creative ways to get around all the “No More” policies!! 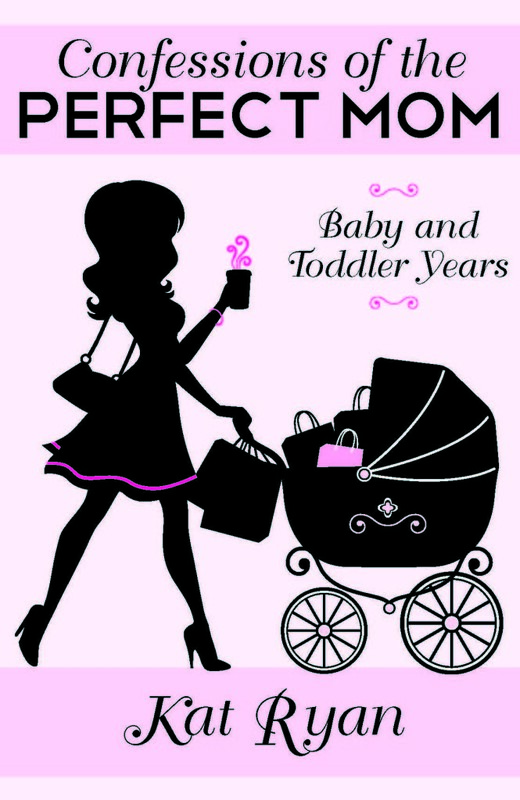 I’ll be making these for a couple great nieces- sounds so easy and they are so cute! They are really so easy!! I call them my cheater bows hehe! You really do make this look easy! 🙂 So cute! Thank you so much!!! It certainly would, and you could make it really big and floppy too. This looks so easy. I love to crochet, but often get bored of it if a project takes too long. This will be perfect. And with three girls, I’m sure I’ll be making several too. Me too!! I have so many half made blankets that need to be finished. This is so quick, I can make them and the kids get something fun in the morning. Let me know how it turns out when you try it. Thanks for the tutorial, this turned out really cute! As a matter of fact, I have started many many crochet projects but this is the first one I ever completed…..LOL. YEA!!!! I totally understand that. It drives poor hubby bonkers, I have like 8 half done blankets. So glad that you were able to finish the bow! !